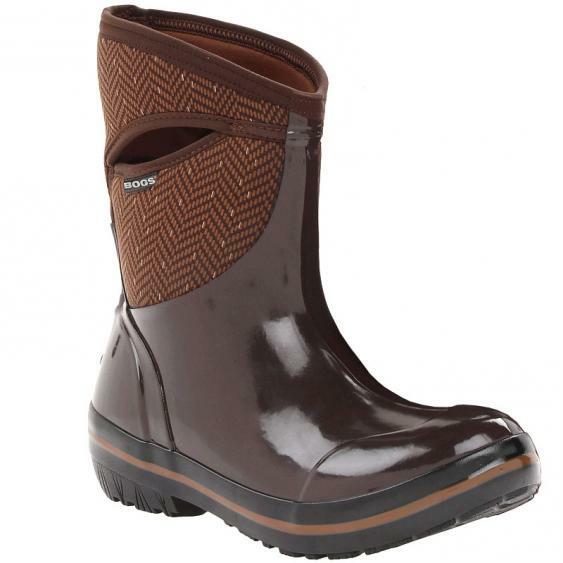 Stay warm while jumping in rain puddles OR snow banks with the Bogs Herringbone Mid boots. This waterproof pull-on women's rain or snow boot features a rubber and printed, four-way stretch Neoprene upper designed to protect against cold and wetness even in sub-zero temperatures. 7mm waterproof Neo-Tech insulation helps to maintain a constant and warm temperature even in the coldest settings, while Aegis™ antimicrobial treatment controls odor and bacteria. The Bogs Herringbone Mid boot is finished with a slip-resistant rubber outsole for maximum traction on wet or icy surfaces.